I’m continually impressed by how quickly Agent Carter moves from a narrative point of view. Given plot threads never seem to hang around for longer than they need to and the succinct 8 episode run definitely seems to have a good structure to it. The ongoing plot of the series is the mystery surrounding Leviathan and it has never failed to be compelling from the time it was introduced. In this episode we find out more information about it and see things get more complicated for Peggy into the bargain. One thing this show does really well is juggling different plot threads that all have really distinct tones. It is all starting to come together but for all intents and purposes they are completely separate stories. I think the time period helps with the sillier elements of the episodes and the well written, well acted characters go a long way towards making things believable. On the lighter end of the spectrum we had Peggy and Jarvis looking for a lead by investigating the long list of Howard Stark’s conquests. I really liked the montage of them visiting all of these scorned women who decided to slap Jarvis to punish Howard for his treatment of them. It was a funny sequence that moved the plot forward nicely. Peggy and Jarvis were on top form this week with their quick witted banter being as sharp as always and the amount of euphemisms to describe Stark’s activities seems to have no end. We see more of Peggy’s attention to detail and resourcefulness from her figuring out that it could only have been a woman who managed to outwit Stark and her noticing the wood on the bed being worn from handcuff rubbing. She makes the connection based on what was learned last week and manages to figure things out. Her lateral thinking is what keeps her slightly ahead of her colleagues. I really liked Dr. Ivchenko (Ralph Brown) and how he was used in the story. Through him we get our theme for the episode in women being overlooked. The Black Widows are all women for precisely that reason. In a chauvinist society men don’t regard women with high esteem so often underestimate them. This has been evidenced repeatedly in this show through Peggy constantly being undervalued by her colleagues. Having this dismissal tie into the main plot by having the possibility of a female suspect ignored when it comes to framing Howard Stark is a really clever move. I also like how it never occurred to Peggy until it was pointed out to her. Dr. Ivchenko had some great interactions with the cast. His manipulation of Dooley was nice and subtle if a little silly that it would work so quickly. It was clever that Ivchenko focused on Dooley’s problems and got him onto that train of thought to lower his defenses and open up. His later hypnotising of Yauch was a little less believable but it worked well enough through strong performances. I can definitely see why Leviathan is a formidable threat. Peggy’s discovery by Sousa was inevitable but was done really well. Sousa’s suspicions have been building slowly ever since he saw the picture of the blonde woman and it striking a familiar chord with him. The show has handled his investigation of this well and it’s good that Sousa has used the facts to conclude rather than leaping to his own conclusions. Peggy’s discovery definitely qualifies as a game changer as far as the show goes. Up until this point she has had the luxury of being ignored by her colleagues and being free to come and go as she pleases without anyone noticing her but just as she’s getting somewhere with her investigation she gets discovered and accused of treason to boot. I loved the scene in the diner where she and Jarvis took down the SSR operatives. They were absolutely no match for her skills and the fight had a fun vibe to it with a really fun soundtrack. Ultimately her escape was short lived but it was good that she didn’t go down without a fight. Dottie was used pretty well in this episode. I found it interesting how amoral she could be but I do wonder why she had to use a rifle when secretly communicating with Dr. Ivchenko. Surely some kind of scope or binoculars would have done the job well. It was clearly to maximise the tension of that scene but it didn’t make any real sense for her to have a rifle that she wasn’t going to fire. It was interesting that Peggy didn’t see her betrayal coming due to lack of suspicion. It’s something I don’t really buy given how suspicious Dottie was acting in the last episode. Also, Peggy being so dismissive over losing her keys seemed out of character for her. Surely she could have put the facts together at that point. Either way the symbolism of the Black Widow’s kiss was a nice touch though I do wonder why Dottie didn’t just kill her right there given that she was ordered to do so by Dr. Ivchenko earlier. She had the opportunity. Another great moment is when the SSR operatives questioned Angie and she used her acting skills to throw them off. She used Thompsons inability to deal with crying women against him and made the situation uncomfortable for all concerned. Fonseca was great in this episode and the scene had the right amount of tension and comedy. 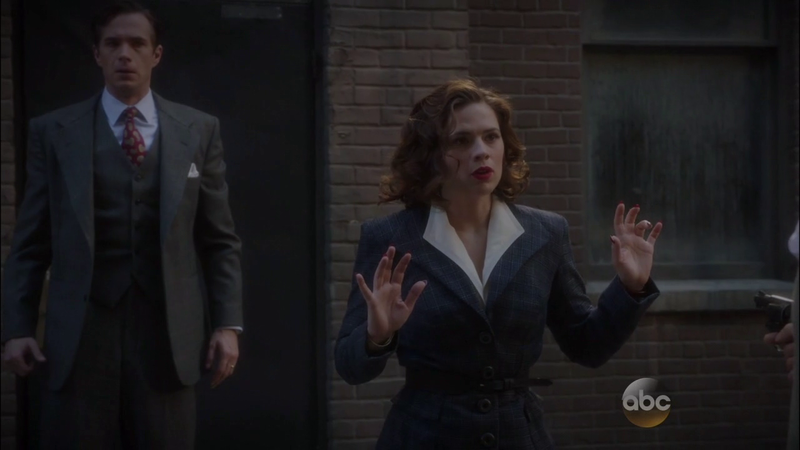 I also liked that she always suspected that Peggy was hiding things even if she didn’t know what those things were. With only two episodes to go this is shaping up to be a very exciting conclusion. Everything changed in this episode and it’s worked really well. A game changing episode that moves all of the main plot threads forward significantly and upping the tension appropriately while never losing that sense of fun that the show does so well. There was some great comedy in the sequence where Peggy and Jarvis question a lot of Howard Stark’s previous conquests to follow up on a lead. The montage of Jarvis being repeatedly slapped by scorned women was hilarious and the euphemism filled banter between Peggy and Jarvis was absolutely spot on. Dr. Ivchenko was well used in this episode as he manipulated Dooley and Yauch expertly using his mastery of psychology. His method of appealing to their personal problems was a great way to exploit their vulnerabilities and it made sense that this would force them to lower their defenses. Dottie’s true nature being revealed to Peggy was a mixed bag and only works because Peggy was acting out of character. Her dismissive attitude to losing her keys is very unlike her and surely it would have forced her to remember that Dottie had done that really obvious dropping the bag trick in the last episode. I did like the symbolism of the Black Widow’s kiss but I do wonder why Dottie didn’t simply use the opportunity to kill Peggy if that’s what her mission was. Peggy’s discovery by the SSR complicates matters severely for her as she can no longer run around in the background while being underestimated. I liked that she didn’t go quietly and held her own for quite a while but was ultimately brought in. The tension has been built nicely and all of the pieces are moving into place for what promises to be an exciting final two episodes.